For some communities, witnessing a neighboring community’s vulnerability is enough to spur action, and there are examples of projects that are implemented with specific climate projections in mind. 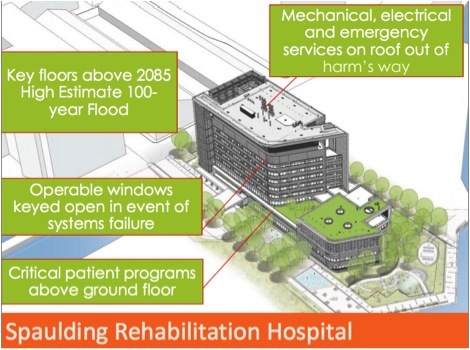 For example, the new Spaulding Rehabilitation Hospital, located on the waterfront overlooking Boston Harbor in Massachusetts, is designed specifically to continue operating through intensifying coastal storms like Hurricane Sandy and withstand sea-level rise. Architects incorporated lessons learned from Hurricane Katrina by elevating the building to 2.5 feet above the 500-year flood elevation, which is more protective than the standard practice of elevating to the 100-year flood. The building also hosts critical utilities on the roof rather than in the basement, generates power with a fuel-pump located in a flood-proof vault, and includes automatic unlocking windows to provide ventilation as well as a route out in a power outage. Boston hospitals have always been at risk from storm flooding, but it was the city’s climate scenarios—paired with the understanding that came from the tragedy at New Orleans’ Memorial Hospital during Hurricane Katrina—that spurred the climate-smart design. Though the designers of Spaulding Hospital made decisions directly in response to the site’s vulnerability to sea-level rise and intensifying coastal storms, climate change is not always the primary driver of actions that increase resiliency. Storms, floods, heat, and drought are not new problems; people have been dealing with them for centuries. Climate change acts as a multiplier on top of existing threats, intensifying hazards and vulnerabilities and increasing the urgency for communities to prepare. As a result, climate projections are often an added factor in the decision to raise a road, floodproof a home, or widen a culvert that has likely been at risk for some time. Given the long list of competing priorities that most communities face, climate adaptation projects that have clear, important co-benefits are easier to push for and more likely to be supported by local government officials and the public. Benefits like immediate or mid-term budget savings, bolstered economic development, improved public health and safety, and enhanced water quality and availability, in addition to climate change preparedness, are often major factors that get projects implemented. 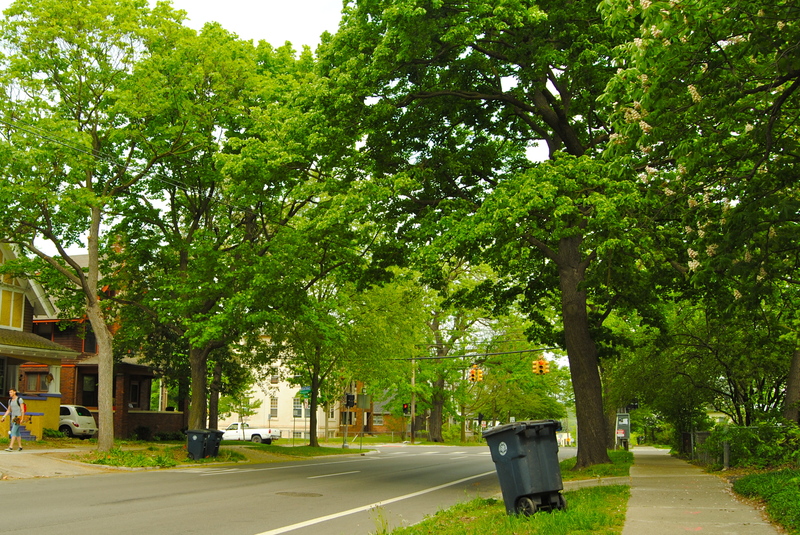 In Ann Arbor, Michigan, for example, the city is investing in a bigger, healthier tree canopy because of the many benefits trees provide, including beautifying streets, absorbing air pollutants, and buffering against climate risks like flooding and heat. Implementation tip #1: Identifying, quantifying, and communicating the multiple benefits of resilience-building projects can help to make the case for implementation. Knowing your audience is important: for instance, some audiences might be most interested in cost savings while others may be motivated by protection of endangered species. In some cases, a project that enhances resilience is undertaken for another reason entirely and increased climate preparedness itself is the co-benefit. 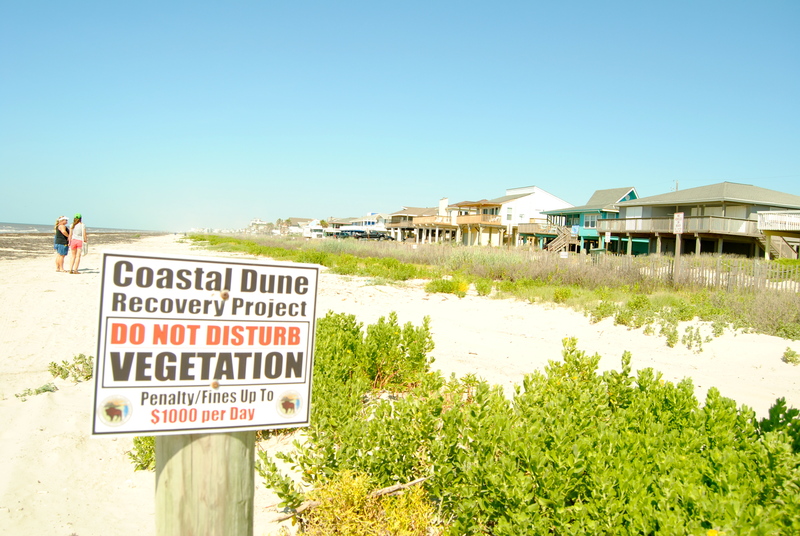 For instance, a dune habitat restoration project on Bermuda Beach in Galveston, Texas provides natural storm protection for a subdivision that was flooded during Hurricane Ike in 2008. The project was organized by Artist Boat, a non-profit organization working to restore coastal habitats while teaching students about the ecosystems through hands-on restoration and art projects. 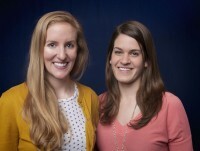 The project funders, the U.S. Fish and Wildlife Service and the Texas Parks and Wildlife Department, were most interested in the fact that the project helped to achieve their mandate to protect endangered species by creating critical habitat for the Kemp’s Ridley turtle. For Artist Boat, a major motivation for doing the project was to engage 300 inner city Houston students who otherwise might not have the chance to go to the beach or gain an understanding of local ecology. Protecting the subdivision against the rising seas and bigger coastal storms expected as climate change intensifies was also an important—but in this case, secondary—reason for implementing the restoration. Indeed, the current political priorities in some communities and states may lend themselves to underemphasizing climate adaptation benefits in order to gain backing for a project. However, in other cases, the opposite may be true, and emphasizing how a particular project helps to prepare a community for climate change can be a way to unlock financial and political support. As more federal and foundation funding streams target climate preparedness, communities may focus the lens of climate adaptation to accomplish infrastructure, conservation, and equity enhancement projects that have been stuck in the queue for a long time. « Older Post Lessons Learned About Life in the ‘New Normal’	» Newer Post How can communities keep up with climate change?